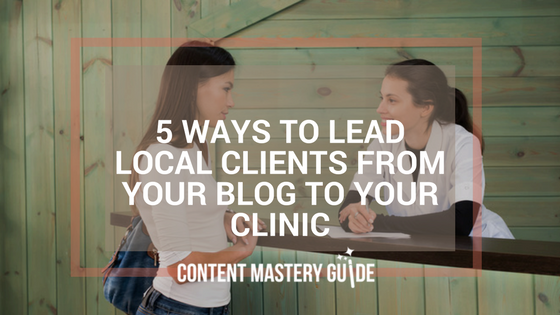 If you’re new to the concept of content marketing, it may be difficult to imagine how publishing an article on your website could help bring clients into your local clinic. After all, if you give people home-care tips to solve their problems, won’t you be blogging yourself out of new clients? It makes sense that the more content you post on your blog and on social media, the more people will see and think of you. What’s most important is what you’re posting. Sales promotions and ads can feel intrusive and give a negative impression of your business, even subconsciously. If, on the other hand, you consistently send helpful, interesting, and entertaining content that people appreciate and enjoy, that positive association will permeate every interaction. From blog to business: As you promote each helpful new blog post in email and on social media, you create positive feelings and establish trust. You don’t only want people to see and think of you often – you want them to think of you in relation to a particular topic or set of topics. On your blog and on social media, I recommend sharing a combination of high-quality original content that your company produces, and equally high-quality content from other sources. The key is that all of this content is centered around key topics that reinforce the expertise you deliver with your products and services. From blog to business: When your network sees you consistently post high-quality content about a particular set of topics, you will be the first one they think of when they or someone they know needs your service or program. When the tips and suggestions you provide are relevant and get positive results, you become a trusted resource in the minds of your readers. By giving advice about the issues they most care about – related to your topic areas – you connect with your readers on different levels and become a bigger part of their lives. Aside from sharing information that helps prospective clients solve a problem, you can also use blogging to invite them behind the scenes of your business to meet your other clients, your suppliers and vendors, your partners, and your staff. These backstage tours create a sense of comfort and familiarity before they even walk in the door. You can also turn the tables and offer people a chance for you to get to know them. Invite them to submit questions, recipes, tips, photos, stories – the sky’s the limit! From blog to business: Familiarity breeds trust, and so the more often you connect with people in meaningful ways, the more comfortable they will feel approaching you to do business. Bonus: As people join in public discussions with you and about you, they can soon turn into customer evangelists who help others discover and trust you. Building onto that sense of familiarity and community, your blog readers and social media followers can enjoy a sense of privilege and exclusivity. While you’ll mainly use your blog for information and not promotion, occasionally you can directly promote your business and something that’s going on there. Your loyal readers and social media followers will be the first to hear, and will want to boost their own online reputation by passing on these great opportunities to their network. From blog to business: Because of the trust, familiarity and goodwill you’ve built by sharing helpful, relevant information, people will be much more open to your sales offers, and more likely to say yes if they’re the right fit.